Sometimes the best that can happen is exactly what happens. 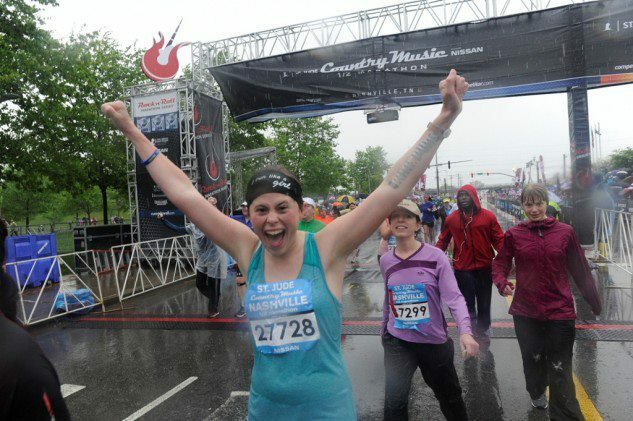 At this past weekend’s Country Music Marathon and Half Marathon what should have been an annoyance turned into a spontaneous expression of hope and joy. As the running community finds its way to healing and recovery from the events of the 2013 Boston Marathon, there will be grand gestures and small remembrances. In Nashville we had some of both. 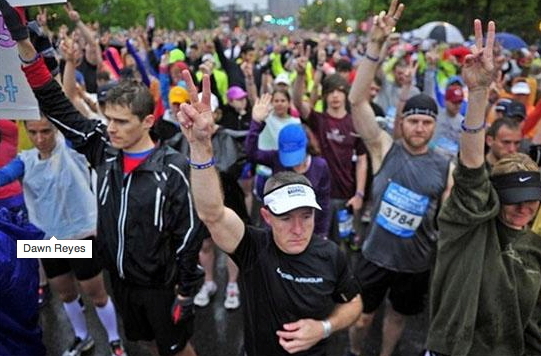 There were runners who had been in Boston but weren’t able to finish who came to bring closure to their experience. Or, at least something that passes for closure in the dark shadows of such an awful memory. There were hundreds of quiet reflections on the what and whys of Boston. And through all the conversations one thread kept emerging. We were not NOT going to run. Frank Shorter talked about the 1972 Olympic games in Munich and hearing the gunshots and then, 40 years later, hearing the explosions. He talked about the shock and guilt and anger. And he talked about how, eventually, you just learn to move on. Just moments before the race was to start, we asked the participants to honor the spirit of Boston with a minute of silence. And, we asked them all to raise their hand and make the “Peace” sign. They did. 20,000 plus runners and w alkers in dead silence. Yep. I cried. But then, the race start was delayed. We got the word to play some music. All of a sudden Neil Diamond’s voice was coming loud and clear over the speakers singing Sweet Caroline and a celebration of life, of running, of community, and of hope over terror broke out. We sang. We laughed. We cried. And in the end we all agreed with Neil Diamond. Good times never seemed so good… so good… so good… so good. That is awesome. Life is good. We just have to grasp every bit of the good we come across. Pretty easy to do in the running community. Thanks so much for this.